Last week I had the pleasure of sitting down with Keri of Keri Golf. Let me say this first, sometimes you get to meet the people behind the brand and you’re bored to death or they’re a bit rude. Meeting Keri was like sitting down with one of my BFF’s. She’s funny, sweet and very chic and her golf bags and accessories are just as adorable as she is. Keri Golf fills the void that other companies have yet to even notice. I love the bold graphic prints of her bags in classic colors. What I love the most is the amount of storage and interior pockets the golf bags have! Now I wouldn’t have to fumble around for my bug spray, sunscreen or extra tees in my bag. 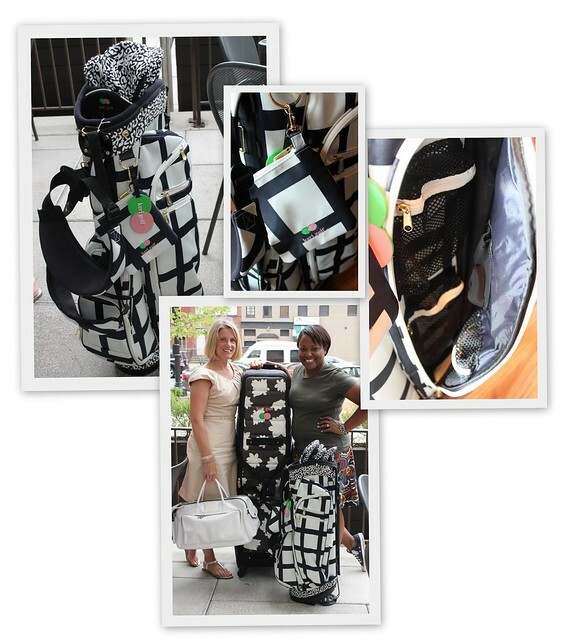 Right now Keri Golf offers very stylish golf bags, head covers, totes and travel bags. She’s branching out into more accessories (check out her white patent leather bag in the photo, very chic) and is partnering up with Adams golf so I hope to see more fabulous things from her in the future (would love to see some matching golf gloves!!). She’s such a wonderfully warm person, I hope to see more great things in the future. Any of you golf? Have you seen Keri Golf in your neck of the woods? Hi – love the site! I met Keri in January and you are so right – she’s adorable, smart and stylish! I love golf too and am always excited to find great designers. Thanks for sharing! Are you on twitter?